We don't fly to Lukla until tomorrow, so we have the day to see some of the sights of Kathmandu. Others have more energy, and have already been exploring on foot, but I am content to enjoy the bus tour. Long ago Nepal was divided into about 60 separate kingdoms, each with a king and a palace. The Kathmandu valley was home to three of these, each centered on a separate city. Today these cities are all adjacent: part of greater Kathmandu. 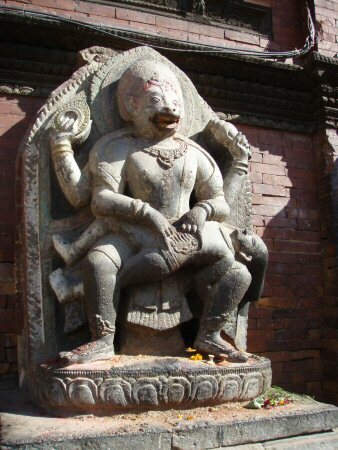 But in ancient times, Bhaktapur, Patan, and Kathmandu were all separate kingdoms with their own palaces. Today we visit two of these: Bhaktapur and Patan. Bhaktapur is a little further out of town, and it seems like it has been less modernized. The old town has not been swallowed or surrounded by a modern town, but still exists as a place that people live and work (and hosts lots of tourists). We get tickets at the bottom of the hill, then climb up to the gates of the palace grounds. 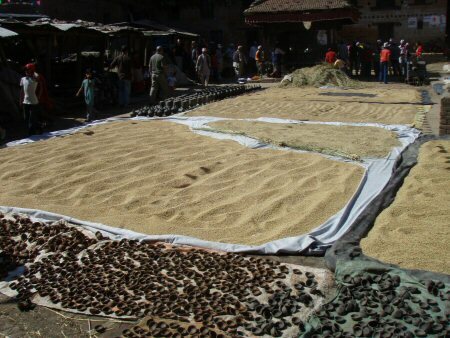 We pass some aggressive vendors, but also many people drying their barley in the sun, people worshiping at temples along the way, etc. The palace square itself has been cleared: it looks kind of sterile. There are many buildings: the wooden pagoda-style structures, with intricate carving; the moorish-style towers, and the long, low palace administrative buildings. After walking through the old square, we emerged on the other side into the living city. Little cobblestone streets thronging with people and motorcycle traffic. There were twisty little streets leading every which way. After a few blocks there would be a square, with old buildings all around. Each square seemed to be different: one was selling pottery, one wood carving,one metal work, one stone carving, and so forth. In between, there was a continual flow of foot traffic, motor bikes, and occasional cars. They went whizzing by at an impressive speed, considering how crowded, narrow, and crooked the streets were. All along each street were storefronts, where people were working or just selling their goods. 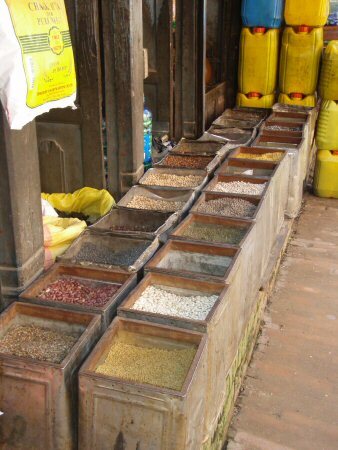 Lots of different foodstuffs: teas, fish, lentils, vegetables. 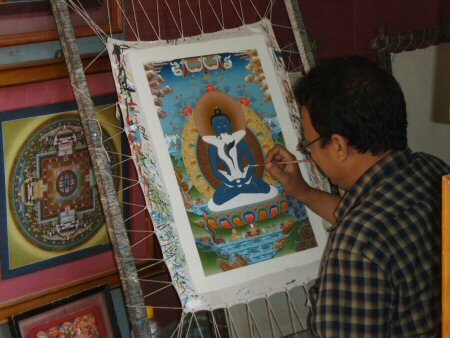 People were carving, painting, weaving, making the goods that they were selling. In contrast to the vendors on the outskirts, the people in town were friendly and welcoming. I could imagine this being how things were here 100, 200 years before (minus the motorized traffic). 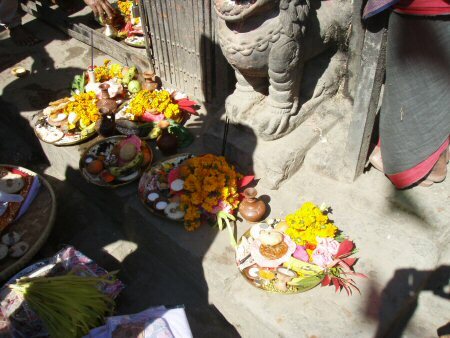 In one of the squares there was a shrine of some kind and there was a ceremony taking place. A series of plates of food were set out on the floor of the shrine, each one an elaborate combination of food, drink, and flowers. Some of these were being carried away after being blessed. I wish I knew what was going on. 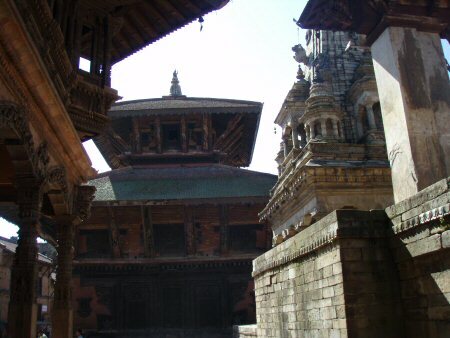 Next we visited Patan, another one of the ancient kingdoms. This has become more of a suburb of Kathmandu, and its palace had become more of a city center. People were going about their business, crisscrossing the square on their way to wherever. 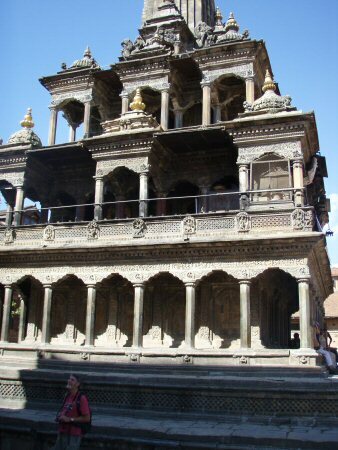 Large wooden and stone palace buildings were present, more a part of things than in Bhaktapur. One of the palace buildings had been restored into a museum, and part of it was given over to a restaurant. Some of us had lunch, which was pretty mediocre. The rest wisely skipped lunch and explored more of the palace square. On the way back and forth to these sites I got to see Kathmandu during the daylight. The streets were jam packed with cars, trucks, and mostly motorbikes. No center line, no traffic lights -- everyone seems to go straight at each other, swerving at the last moment to let oncoming traffic pass. There are smoky fires burning everywhere -- trash apparently -- and it makes the city pretty hazy and makes it pretty hard to breathe. In the evening, we were visited by a monk from the local monastery, who prayed for our safety and well being, for good weather, and for success. The head monk had made a special knot in red cord for each of us, and we were invited to wear it during the trip for good fortune. We all took this pretty seriously, put on our special knot, and wore it for the rest of the trip.